We sometimes call them Galapagos cars because they’re uniquely evolved products designed exclusively for a closed market—something that runs in stark contrast to the rest of the globalized auto industry. They exist for tax and insurance reasons in Japan and designed to be super small for its crowded streets and tiny parking spaces. Some kei-cars have found their way overseas, such as the Daihatsu Copen, which was exported with a larger 1000cc engine. For the most part though, kei-cars are as uniquely Japanese as maid cafes. Previously, I hadn’t had much experience with kei-cars. I’ve driven the Honda S660 a few times, but that’s a sports car, and not exactly indicative of the average kei-car. More recently I drove an older Honda kei-truck during Monterey Car Week. While those are popular in Japan, primarily for commercial purposes, the average kei-car has a more traditional hatchback shape. So it was time to humble myself and see what it’s like to live with a “regular” kei-car. These are the most basic and purest form of private transportation, an affordable way to move the masses. If 1.8 million of these were sold last year, making up a third of the new car market in Japan, they can’t be that bad? This would be my first time driving a modern kei-car, the sort of car that’d usually be driven by grannies, families, and salarymen alike. Almost all Japanese manufacturers will sell you a kei-car of some sort, though not all of them all manufacture them. There are pretty much only four main kei-car manufacturers; Honda, Mitsubishi, Daihatsu, and Suzuki. They largely badge engineer their kei models to other manufacturers. 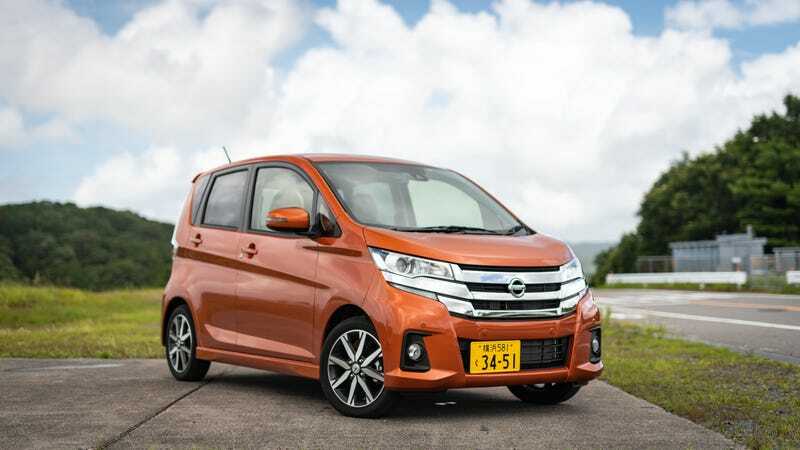 It should come as no surprise Nissan get their kei-cars from Mitsubishi, its new corporate cousin. Some basic specs on this Nissan Dayz before we begin: by law all kei-cars must be within 3490mm in length, 1490mm wide, the maximum engine size is 660cc and mustn’t produce more than 64 horsepower. Oh, and it helps if your kei car has a silly name too, like Honda N-Box Slash or Pixis Mega. As long as you keep within those regulations the sky’s the limit with what you can do with the kei-car recipe. There’s been everything from mid-engine gull-wing sports cars, three-wheeled trucks, and whatever the Mitsubishi Minica Toppo was (a kei-Popemobile thing). The Dayz Highway Star has the necessary criteria, and it even has a silly name. Under the hood is a 660cc three-cylinder turbocharged engine producing 64 HP and 69 ft-lb of torque. Power is sent to the front wheels via a CVT. Very rarely nowadays do you find manual kei-cars, but it’s no surprise these are the most entertaining to drive. But for its intended purpose, basic transportation for the masses, 64 HP felt adequate. I couldn’t help but think throughout my time with the Dayz how much better it would’ve been with an electric motor. Mitsubishi had the i-MiEV a couple years ago but was perhaps too ahead of its time. Manufacturers are slowly electrifying their kei-cars. Suzuki’s new Wagon R has a hybrid version. Nissan and Mitsubishi, with their extensive hybrid and EV knowhow, should follow suit. See, Kei-cars are very much made for city and town driving. I’ll be perfectly honest and admit the Dayz was by no means a fast car but there were times it felt pretty brisk, even while carrying three adults. You can get it with a naturally-aspirated engine with 50 HP, but the turbo engine was energetic enough for most urban driving needs. Because it’s so light, it tips the scales at about 1,940 lbs, there’s a sense of urgency in the way it zips through city streets. Get a bit more spirited with your driving and it starts to show some faults. Forget all the Mitsubishi Evo or Nissan Z DNA you might have hoped for—this isn’t a sporty car nor does it even try to be sporty. The steering and brakes felt vague, there’s a worrying amount of body roll every time you go around a corner at speed, and if you go around a corner too enthusiastically it’ll respond with understeer. Those Bridgestone Ecopia 165/55 R15s aren’t going to do much for cornering grip. You could almost say it understeered for dayz. However, keep it within its limits and it can still be fun to drive. Because of its asthmatic amount of power, your foot has to be on the accelerator pedal at all times. It many not be the most economical way to drive but a lot of fun. There’s something very enjoyable about driving a no-nonsense, zero frills car. It knows what it is and isn’t ashamed of it. In urban environments this thing excelled. Dare I say it, I actually had fun driving the Dayz around town. The fun mainly came the smug feeling of knowing you can fit in through virtually any gap. The light steering and permanent throttle application made easy work of navigating through some of Tokyo’s narrow roads and alleyways. And I do mean light steering; this had to be the easiest car I’ve driven, which is sort of the point. That’s partly due to the visibility, which is fantastic thanks to the massive windows. It felt like a mini-minivan in that sense. Because the panels and pillars are smaller to increase interior space, there were no blind spots. It even had normal sized wing mirrors. I was surprised by all the fancy features this top-spec Dayz came with. They may be small, but they’re not always spartan. This one came with automatic high beams, lane departure warning, collision warning, a reverse camera, rear parking sensors, auto dimming rear view mirror, adaptive Xenon headlights, touch panel climate control, navigation, Bluetooth, keyless entry and start, and stop/start. In a kei-car! Despite all that, they remain cheap. Prices for the Dayz starts from ¥1,157,760 ($10,340) and the top spec car I’m testing starts from ¥1,520,640 ($13,581). Nissan claims an average fuel consumption of 54.5 mpg. I was getting about about 40 mpg which isn’t terrible. It only has a 30-liter (7.9 gal) fuel tank so filling it up never cost more than $40. For getting around the city and town it was fine and gave me no issues. Even on countryside roads, where the speed limit was an annoying 60 km/h, the Dayz coped well. Visit any Japanese town outside the main cities and you’ll notice most cars are kei-cars. Their small size and affordability are only part of the reason why they account for a third of all new cars sold in Japan. Since there are also tax and insurance incentives, the annual road tax for a kei-car is about a third of the cost of a normal family hatchback. Of course, it’s not all perfect. If you like soft touch plastics in your interior, look elsewhere. This top-spec Dayz may have all the bells and whistles of a more premium car, but the plastics are still very much befitting its price tag. But the plastics aren’t the interior’s biggest problem, it’s the space of lack thereof. Sure, it’s not a car for carrying people but with four seats it should be able to fit four adults, right? I’m about 5'10"—taller than most Japanese, sure, but hardly a giant—and I had trouble sitting comfortably behind my own driving position. Headroom was fine; legroom was a bit lacking. If you want to carry both people and things, it gets even more complicated. It may have four seats but with three people and luggage for a weekend away, we had to convert the fourth seat into extra luggage space. This isn’t really a car you’ll buy to carry people and things on long trips but it should still be able to carry people and things. For young families with strollers or anyone wanting to carry something bigger than a suitcase, it might prove to be a struggle. Granted, there are more spacious kei cars on the market with cleverer storage solutions. But I was surprised by how few things and people the Dayz could carry. It seemed to be a choice of one or the other. But the biggest flaw of the Dayz, and indeed every other kei-car, is that it’s not a car to take on a road trip. My week with the Dayz consisted mainly of driving around Tokyo, where it felt most comfortable. However, I needed to go to Tsukuba in the weekend for an event. Which meant driving the Dayz two hours north on the motorway. Suffice to say it felt somewhat unstable at motorway speeds, especially when it was being battered strong wind and rain. Cruising at 100 km/h was about as fast as I was comfortable doing, anything faster than that is not only illegal but also quite worrying. Speed is one thing but there’s always a reminder there’s not much between you and other road users. As it’s meant to be as basic as a car can be, there’s little in insulation so you get quite a lot of wind and road noise. It’s small size also means trucks and buses don’t always see you in their mirrors. More than once I’ve had larger vehicles pull out in front of me. Don’t even think about overtaking unless there’s a long clear gap ahead of you too. A Highway Star, this is not. It wasn’t un-drivable, just uncomfortable. Perhaps an hour or so on motorway driving would’ve been as far as I’d be willing to go in a kei-car. Keep it in town and cities, and off the motorway, and it’s a pleasant car to scoot around in. These types of cars were never going to be something you buy with your heart, but for something that’s supposed to be the most basic form of a car, it’s not at all bad. The Dayz isn’t a particularly special or unique kei-car. It’s representative of a lot of the generic offerings in this segment. It isn’t a car you’d buy if you plan on doing a lot of long distance driving. It’s probably not even a car you’d buy because you like it. You’d buy it out of convenience. It’s simply a tool, a machine to get you from A to B, and to squeeze into tight parking spaces when you get to B. But somehow for some silly reason, perhaps because it’s such a unique driving experience, I enjoyed the Dayz. I liked the honesty of it more than anything else.